CARFAX 1-Owner. FUEL EFFICIENT 26 MPG Hwy/18 MPG City! EX trim, Crystal Black Pearl exterior and Gray interior. Third Row Seat, All Wheel Drive, Rear Air, Back-Up Camera, Satellite Radio. Rear Spoiler, MP3 Player, Privacy Glass, Keyless Entry, Steering Wheel Controls. Honda EX with Crystal Black Pearl exterior and Gray interior features a V6 Cylinder Engine with 280 HP at 6000 RPM*. Edmunds.com explains "Despite being appreciably more spacious and functional inside than most competitors, the Pilot is actually smaller and lighter than them as well. This relatively Low weight combines with a stiffer structure to make the 2016 Honda Pilot feel impressively solid. ". Great Gas Mileage: 26 MPG Hwy. 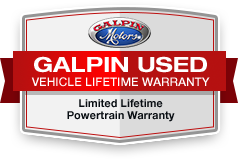 We invite you to Galpin Honda. Winner of the 2016 President's Award. This award is the most prestigious award offered by Honda and is given to those dealers who excel in customer service, sales, training, and facility operation. Our friendly, knowledgeable staff will help you find the Car you want that fits within your budget. Galpin Honda consistently carries a very large selection of New and used vehicles, so you don't have to drive all over town!